In the Christian calendar January 6 is Epiphany or Theophany, which means the manifestation of God. The day celebrates the revelation of Jesus as the son of God when he was baptized in the Jordan river by John the Baptist and/or when he was visited by the three wise men, at which time he was revealed to the gentile world. A few Orthodox churches adhere to the ancient Julian Calendar, which is 13 days behind the Gregorian Calendar, making Julian January 6 = Gregorian January 19. Likewise, Julian December 25 is Gregorian January 7, and that is why some Christians seem to be celebrating Christmas on January 7; really, they are celebrating on December 25 but in a different calendar. This brings me to the 12 days of Christmas. As a secular American, mostly familiar with 2 days of Christmas, if you count Christmas Eve (not to mention the 50+ days of commercial-Christmas inundation), I was always vaguely baffled by the 12 Days of Christmas song. I guess I half-consciously assumed it was an old and/or foreign custom and left it at that. Maybe some of you can relate and will appreciate a bit of clarification on the subject; maybe this is all common knowledge that was passed out while I was daydreaming about the piles of loot Santa was going to leave under our tree. It turns out my dismissal of the 12 days as old or foreign is pretty much correct. For the record, I find old and foreign customs very interesting, unless associated with an annoying and endless song. To this day, the 12 days of Christmas are acknowledged by Christians around the world, outside the United States of America. Generations ago, in the U.S., the rhythms of commercial Christmas swallowed those of liturgical Christmas and now we count the shopping days before Christmas Day rather than the holy days after. The 12 days of Christmas, also known as Christmastide = December 25-January 5. January 5 is 12th Night, the bridge from Christmastide to Epiphany and the festival season, which lasts through Mardi Gras. As far as I can tell, there’s no particular significance to each of the 12 days, rather it’s a prolonged celebration of the birth of Jesus. In some traditions, gifts are exchanged on each of the 12 days. In Greece, gifts are typically exchanged on January 1st, St. Basil’s Day, rather than on December 25th. There’s not much of a tradition of Christmas trees in Greece but it’s common to keep a sprig of basil wrapped around a small cross hanging over a bowl of water. During the 12 days, the basil-cross is dunked and water is sprinkled throughout the house to ward off the dark elements of the season. 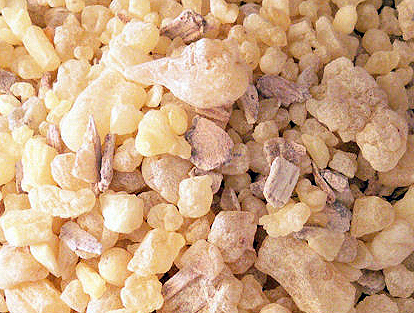 In Greece, during the 12 days of Christmas, the country is plagued with little demons called kallikatzaroi. They hide in dark crevices during the day but come out at night and subject the land to rampant mischief. Yule logs are kept burning day and night to prevent them from coming down the chimney or old shoes are burned as a smelly repellant. With the traditional blessing of the waters on Epiphany, the kallikatzaroi are sent back underground, where they spend their time sawing at the world tree in order to topple the earth. While they are wreaking havoc for 12 days on the surface, the world tree heals and they must start sawing anew on January 6th. Essentially, the Greeks endure chaos for 12 days in order to save the world. (Thanks, most grateful!) Conversely, the kallikatzaroi sacrifice the fruits of 353 days of hard labor for 12 days of utter abandon, the mother of all frat parties. The kallikatzaroi may be cultural remnants of the Dionysian rites of antiquity, when possessed and intoxicated devotees of the god of the vine ran around behaving in extremely uncivilized ways. Happy Epiphany to all who celebrate and congratulations to Greece (and the world!) for surviving another year despite the best efforts of the kallikatzaroi. 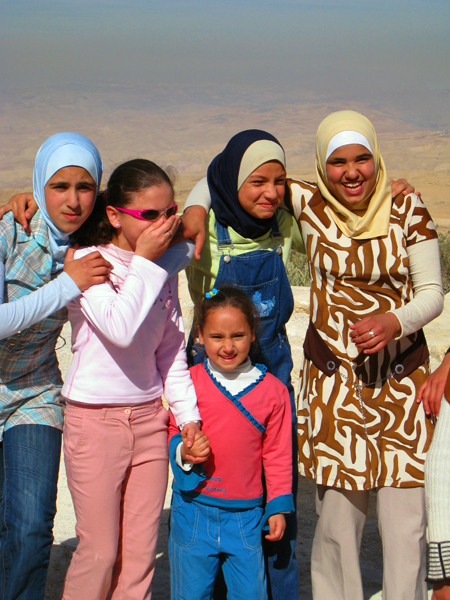 Everyone knows about Petra in Jordan; it’s the headliner, and for good reason. 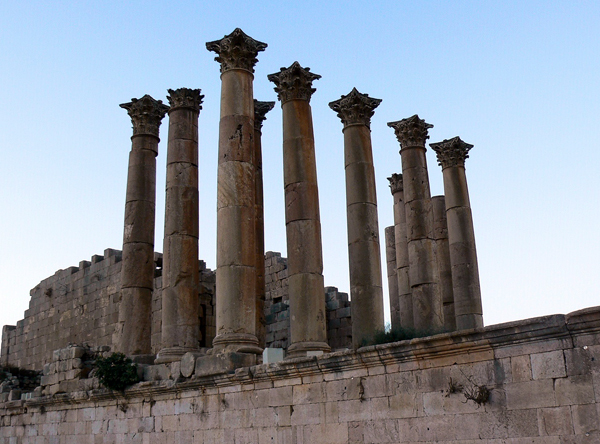 But Jordan is also home to some very important religious sites. 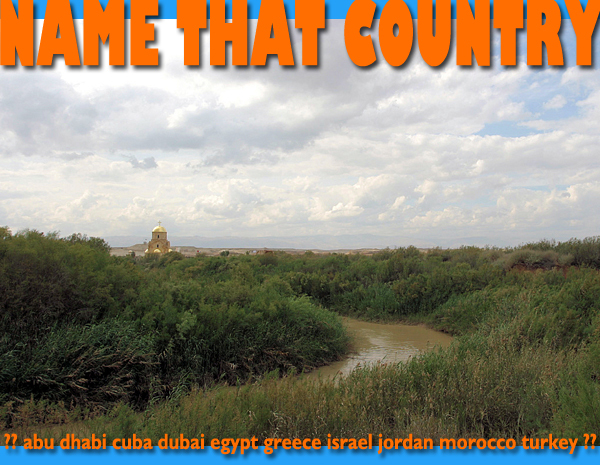 It’s just across the Jordan River from Israel and very much part of the Holy Land. 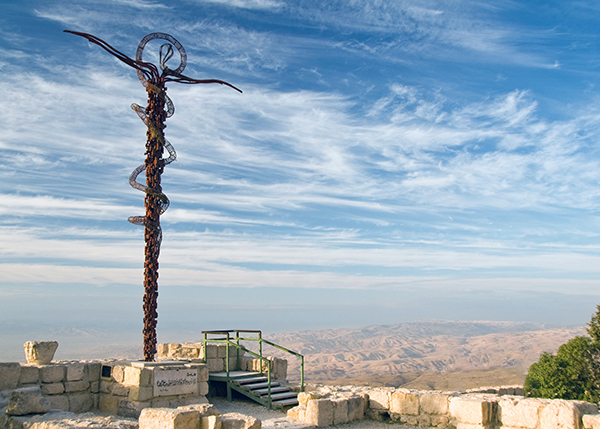 Mt.Nebo is traditionally believed to be the site where Moses died and was buried. 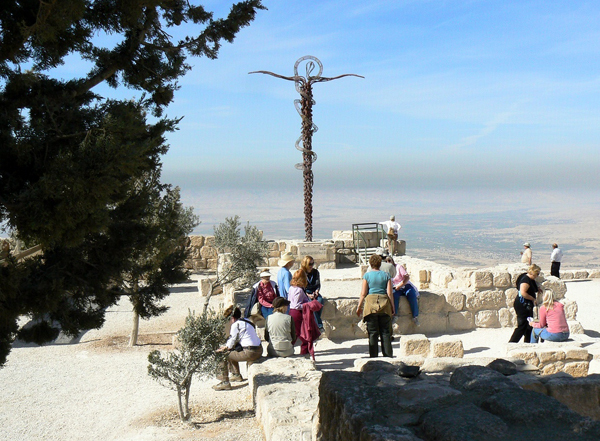 After wandering in the desert for 40 years, he was denied entrance into the Promised Land but he was allowed to look upon it from Mt.Nebo. 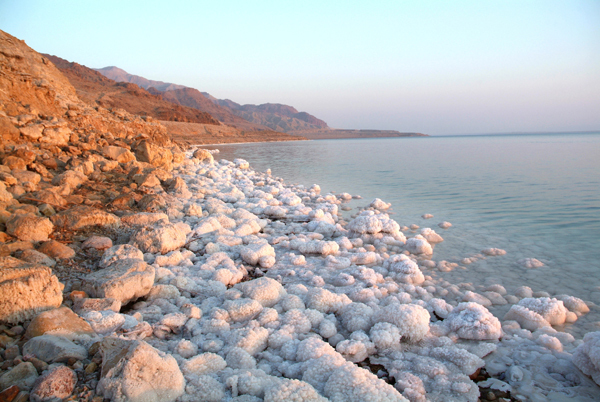 As the story goes, Moses and the Israelites had been wandering in the desert for many years. It was hard on everyone. There was a great deal of kvetching and little gratitude, faith or loyalty among the Israelites. When he went out to get water for this mob of moaners, Moses was on his last nerve. “Fine,” he said, “we’ll get you your gosh darn water!” He struck a stone three times and water poured out. In that moment, Moses committed at least three sins and his fate was sealed. He failed in his responsibility as leader by losing his temper. He disobeyed the Lord by striking the stone rather than speaking to it as instructed. And, probably worst of all, he failed to properly credit the Lord for the miracle. His punishment was to never set foot in the Promised Land. It seems a harsh penalty. The poor guy left a life of royal luxury and accepted a thankless mission of extreme hardship. Why not give him some latitude, for pity’s sake? On the other hand, he fell short in his assignment of obedience to the Lord and leadership of the Israelites. 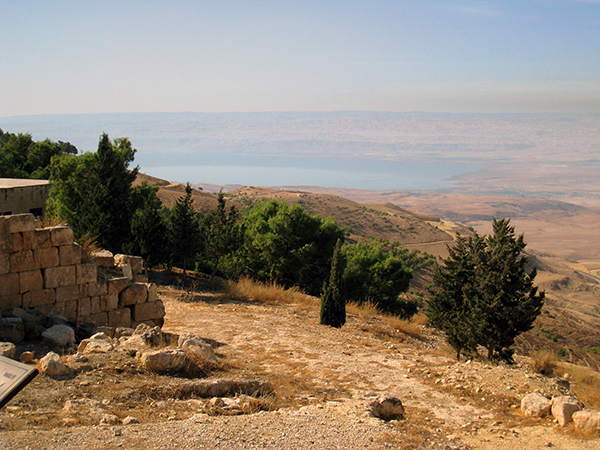 There’s plenty to ponder while standing on Mt.Nebo looking out over the Jordan Valley. 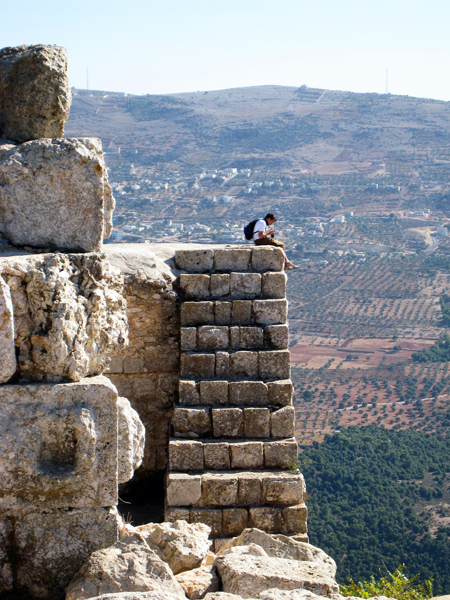 If conditions are right, you can see Jericho and beyond to Jerusalem. Remains of a Byzantine church are incorporated into the modern church on site, which houses some very nice mosaics and the soaring serpentine cross sculpture at the edge of the summit seems to hang from the sky. It’s all very moving. 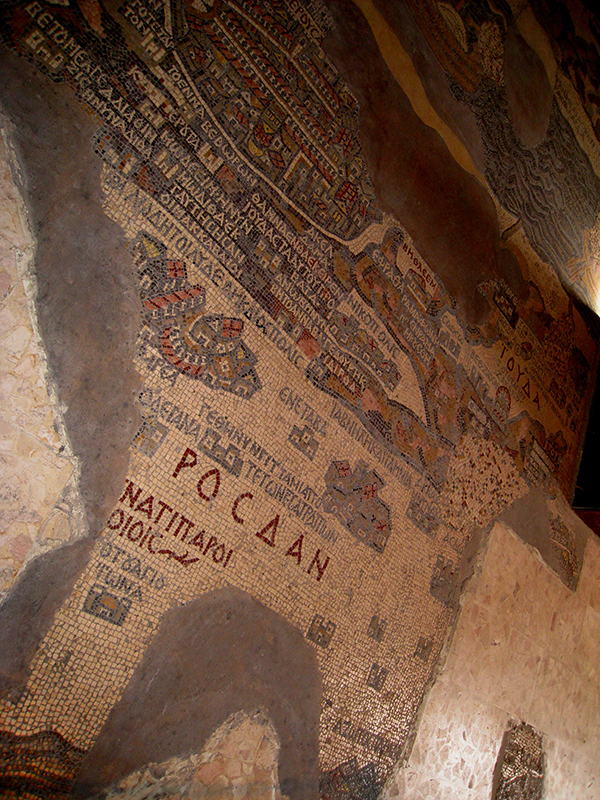 Just down the road about 5 miles is Madaba, famous for mosaics. They’re still excavating Byzantine remains all over town. The Basilica of St. George is the main attraction, where you can see the famous 6th-century map of the holy land in a mosaic floor. About a 20 minute drive from Madaba at the very southern end of the Jordan River is Bethany Beyond the Jordan, the site widely believed to be where Jesus was baptized by John the Baptist. There’s very strong archaeological evidence to support that belief. 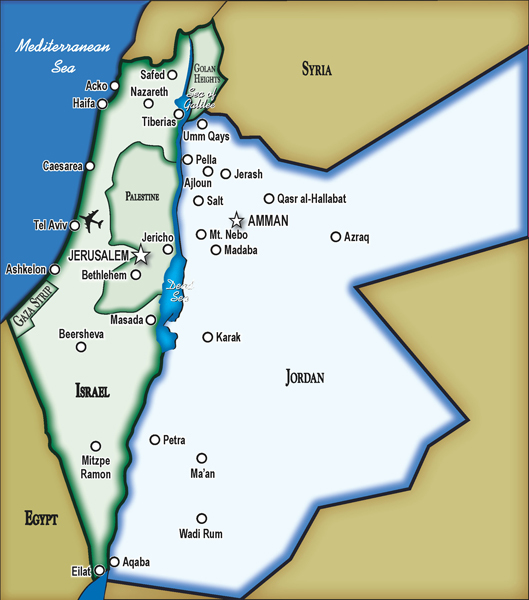 After the 1994 peace treaty between Israel and Jordan, this border area had to be cleared of mines. Excavations began in 1996 and have uncovered Roman and Byzantine remains of baptismal pools, churches, pilgrim lodgings, hermit caves, a monastery and a prayer hall. 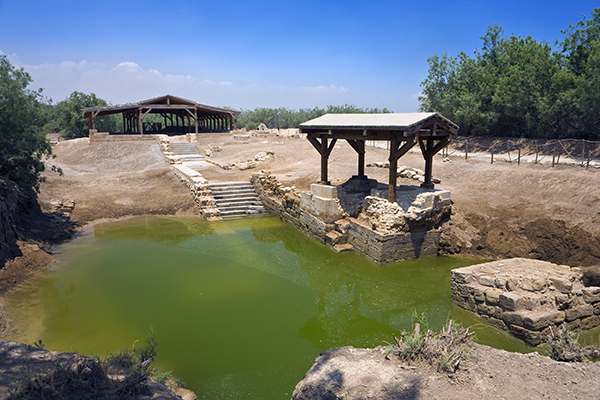 This is also believed to be the site from which the prophet Elijah ascended to heaven in a chariot of fire. I’m not at all religious but I was affected by the serenity of this place. Just thinking about it now is calming. My secular being has been similarly moved to the core at Mt. 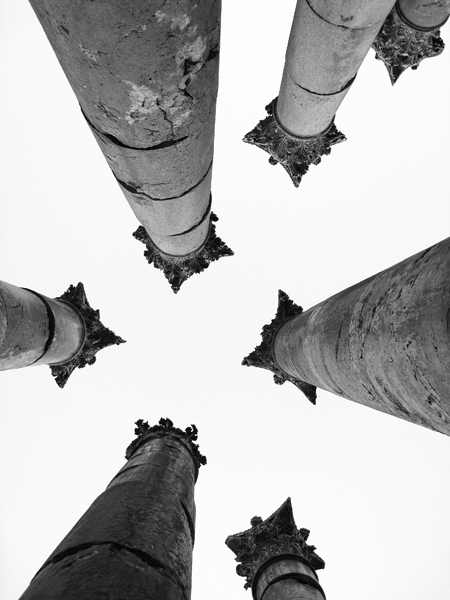 Nebo, Holy Sepulchre, the Western Wall… Is there some inherent power in these places that is deeper than their associated spiritual traditions? Or does centuries-of-pilgrim-ardor hang so thick that even casual visitors are swept up in it? Or is it just the suggestion of emotional response that makes it so? While these are interesting questions to consider, perhaps why we respond the way we do is far less important than the response itself. Aspire to faith in experience and acceptance of the unexplained. Ultimately, no matter our system of belief, the source of the feelings inspired by these places is the same for all of us. What differs is how we explain those feelings. 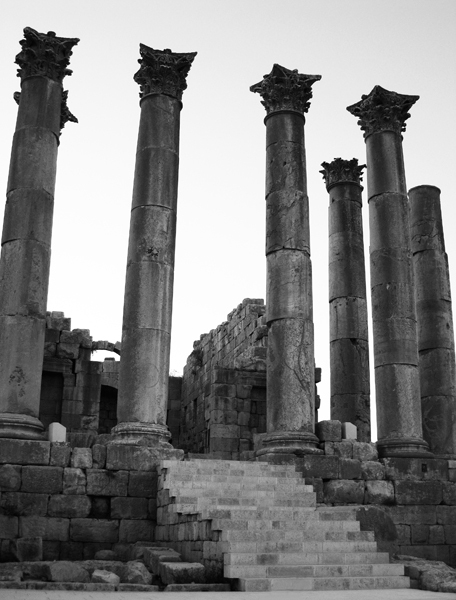 See our tours to Jordan here. 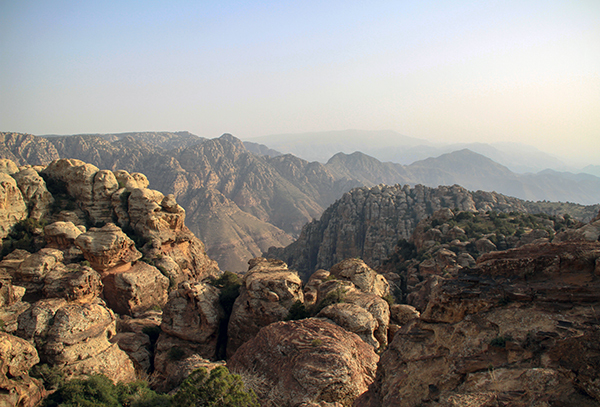 You might not expect to find such a lush place in our mystery country, which is largely desert. This small green ribbon is in the far west of the country. The river pictured forms part of the western border. 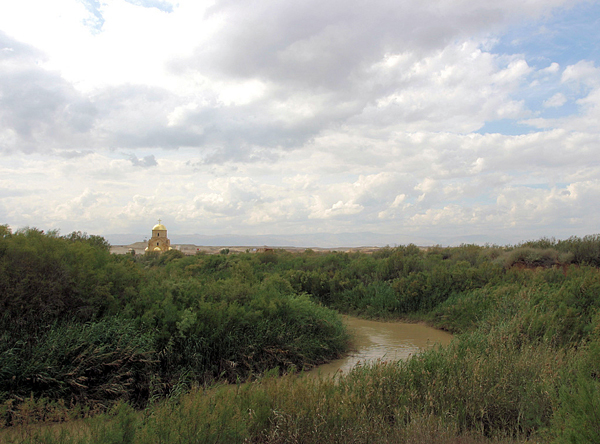 This specific place has been a site of Christian pilgrimage since the 4th century, if not before. 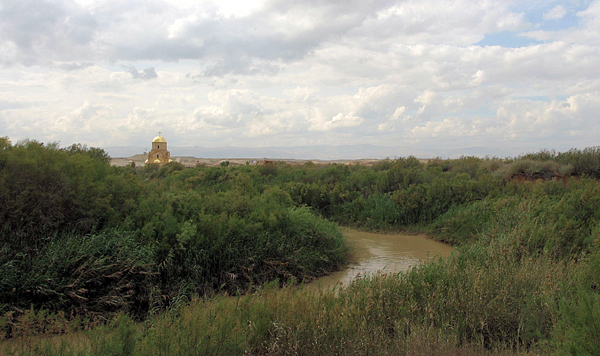 The Greek Orthodox church in the distance is a modern addition but the remains of ancient churches and lodgings for pilgrims are scattered around the site. Excavations only began 20 years ago, after our mystery country and its neighbor to the west made peace. 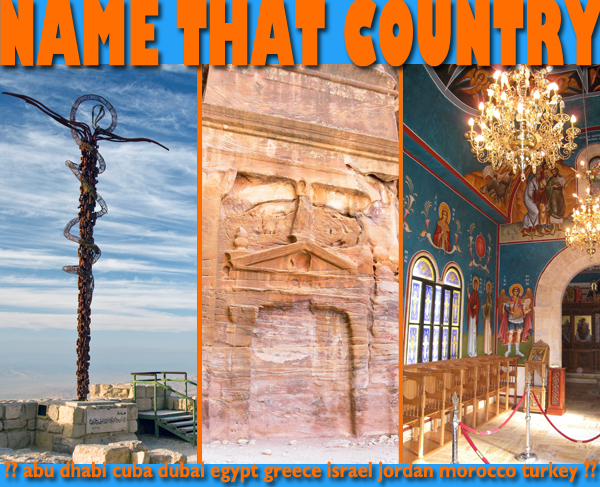 Can you name that country? What about the site?